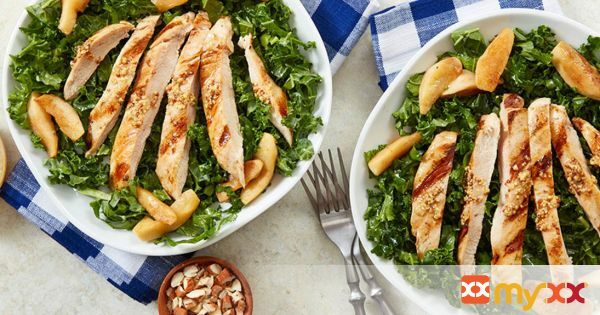 Hard Apple Cider Glazed Chicken Kale Salad- grilled chicken, on a bed of fresh kale, with warm Granny Smith Apple dressing. 1. In a medium saucepan combine 1 bottle of hard apple cider and 2 tablespoons of brown sugar. Boil for about 15 minutes until reduced to ¼ cup. 2. Brush the chicken breasts with olive oil and season with salt and black pepper. Heat a grill or grill pan over medium low heat. Place the chicken breasts on the grill and cook for 5 to 6 minutes per side. Baste with hard apple cider glaze during the last 5 minutes of grilling, being careful not to burn the glaze. Chicken is done when a meat thermometer inserted in the center reaches 170° F. Remove from grill and let rest for 5 minutes before serving. 3. In a medium skillet, melt the butter over medium heat. Add the apple slices and sauté for 5 to 8 minutes until browned. Transfer the cooked apples to a bowl and keep warm. Add the remaining bottle of hard apple cider to the skillet and bring to a boil. Reduce the heat and simmer for 5 minutes until dressing is reduced to about ½ cup. Remove from heat and swirl in the mustard. 4. Transfer the chicken to a cutting board and slice into serving pieces. Divide the kale between 4 plates. Top with slices of chicken and apples. Pour the warm apple dressing over all and serve.